Modern British cuisine in London has undergone a significant revival in recent years. It’s out with the bland, boring and boiled. There’s now a focus on seasonality, inventiveness and finesse like never before. A number of restaurants round my neighbourhood in the East End have led the charge on this front. Upstairs at the Ten Bells – still one of my favourite local restaurants – was one of the early pioneers. Then came its stunning sister restaurant down the road in Shoreditch, The Clove Club. In more recent months however, a little restaurant on a quiet residential street in Hackney has also picked up the gauntlet. And if you haven’t heard of or dined at Mayfields by now, you are missing out. Despite a tiny dining room with even tinier tables, a simple deco, friendly staff and an abundance of natural light give the place a wonderfully laid-back vibe. But it’s the food here which really takes centre stage. Head chef Matthew Young, formerly of the Wapping Project and New York’s Gramercy Tavern, is serving up some seriously impressive Modern British food in the most unassuming of locations. The ever-changing menu of small plates celebrates the best of seasonal British produce. Expect innovative combinations and impeccably presented dishes that will give any Michelin-star restaurant a serious run for its money. And with smaller plates priced round £6 – £8 and larger ones from £10 – £13, it’s incredible value for the quality you are getting. With fewer options on the lunch menu relative to dinner, our party of three soon found ourselves ordering more than half the menu on offer to share. First of the smaller plates to arrive was a gorgeous looking Mackerel dish, ‘reconstructed’ with chargrilled spring onion, poached rhubarb slices and coriander leaves. But I assure you, it was much much more than just a pretty plate of food. All the garnishes brought something to the party, complementing as well as and cutting through the oily richness of the cured fish. Next up, their rustic Smoked Eel Brioche. Although less pretty than the Mackerel dish, it was by no means less tasty. 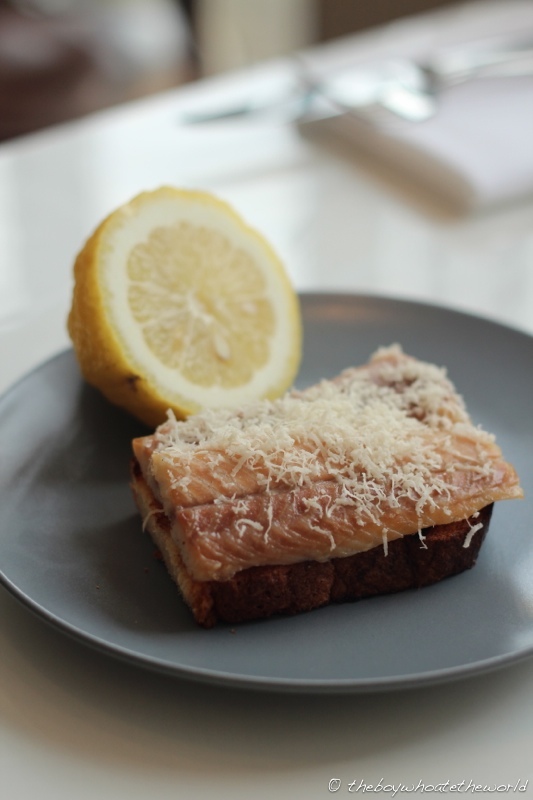 The intense, full-bodied flavour of the smoky eel fillets was balanced beautifully by the freshly grated horseradish and zingy acidity from the lemon. The larger plates which followed were even more stunning. 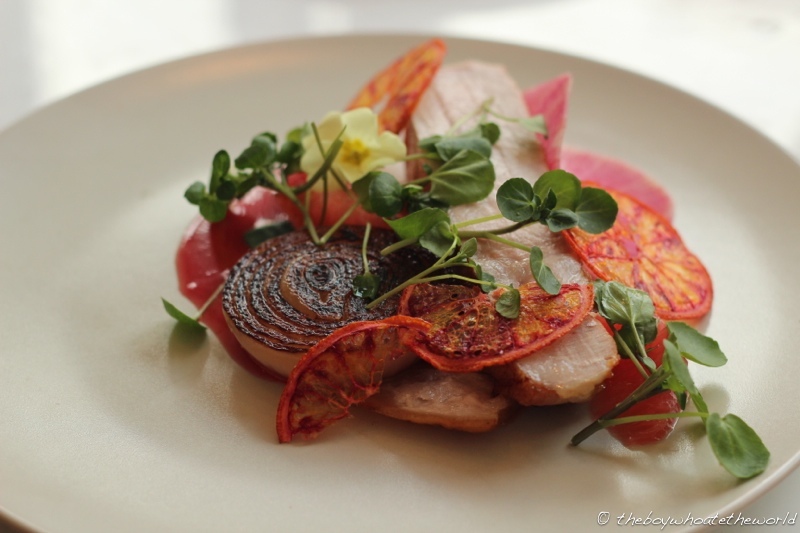 The highlight for me was their Pork dish, garnished with blood orange, grapefruit and watercress. As far as aesthetics go, it was easily one of the most beautiful plates of food I’ve had all year so far. The colours on the plate just leapt out and I loved the spectrum of flavours and textures at play… everything from the succulent pork to the tangy grapefruit sauce… the juicy, burnt onion petals to the crispy dehydrated blood orange slices. 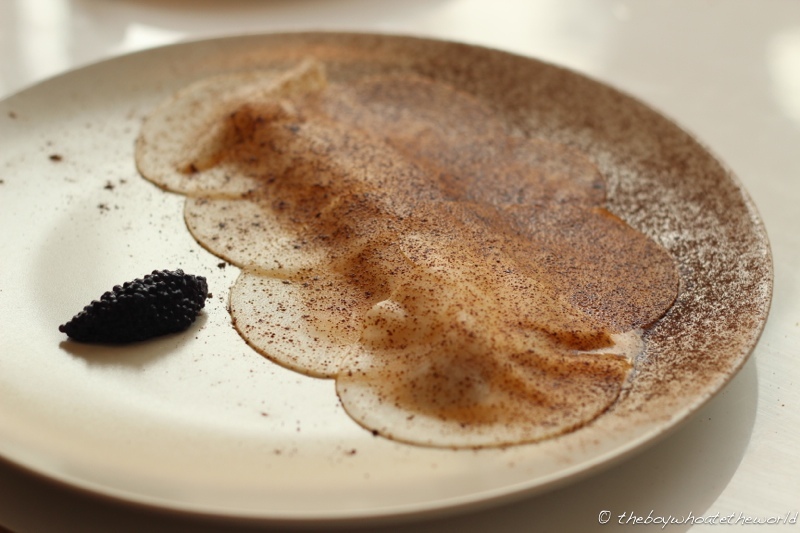 Lemon sole, poached in citrus butter, then concealed under wafer-thin Daikon ‘scales’ and finished with liquorice powder was yet another accomplished and clever dish. The unusual combination worked wonders on the palate. The fish simply melted away in the mouth, releasing the moreish yet fresh flavour of the citrus butter. Then came the rest of the garnishes… the fish roe accentuating the flavour of the sea whilst the subtly sweet aniseed flavour of the liquorice adding another dimension. A cracking dish on the whole and one I hope to see again on their ever-changing menu when I return. Dessert – lemon curd served with almond cake & pepper ice-cream – though decent and well-balanced didn’t really knock my socks off. On any other day and at any other place I probably would would have been perfectly content with it. But with the fireworks of the earlier courses, dessert was always going to play catch up. All in all, the food being served up here at Mayfields is quite simply Modern British cooking of the very highest order. Rarely have so many dishes from a single meal stuck with me, even several weeks on as I write this post. Perhaps given its slightly off the beaten track location, it will never attract as much of the limelight or hype of some of it’s more centrally located peers. But if that means you and I can waltz in without a reservation for lunch or mid-week dinner for many years to come, perhaps it’s a blessing in disguise. Great review. I cooked with Andy Oliver when he took over Mayfield’s a few weeks ago and loved the place. Great location, awesome space. In fact loved it so much I have booked a table for Saturday night. Thanks for the review, you’ve got me more excited than I already was. @Sebby: It’s def one of my fav restaurants in town! Was the takeover a one night only event? What were you and Andy cooking up- Thai? Hi Guan, yes it was a one night take over cooking Thai food, went really well. By the way I’ve just accepted a new job cooking wood ember smoked Cornish meats and fish with Thai flavours. Will be opening on Dean street in the end of September. Hi, @Sebby What is the company name and their contact number. I’d like to be part of your opening day.